We are rightly proud of our three choirs. 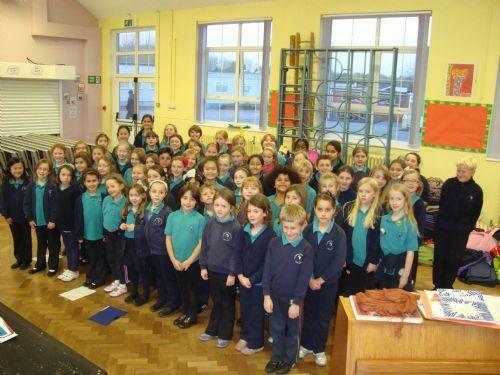 We currently have over 100 KS2 children who enjoy singing in our clubs every week. Our choirs perform at our annual community concerts held at St Martin's Church, The Gate Arts Centre & The Royal Welsh College of Music & Drama. Senior Choir takes place every Thursday lunchtime. All children in Years 4 - 6 are invited to join. Currently we have nearly 50 members! New faces are always welcome! If you'd like to join, please speak to Mrs Clarke or Mrs Joll. This club takes place every Monday lunchtime at 1pm in the Music Room and is for boys in Years 3 - 6. Each meeting lasts around 10 minutes so boys have time for their lunch and some play in the yard before the session. This year we have over 40 boys taking part! New members are always welcome - please see Mr Williams. This club takes place every Wednesday lunchtime at 1pm in the Music Room and is for pupils in Year 3 only. Each meeting lasts around 10 minutes so pupils have time for their lunch and some play in the yard before the session. This year we have over 40 Year 3 pupils taking part! This club is extra special as our friends from the community, The Rhydypenau Goldies join us and perform with us at our concerts. New Year 3 members are always welcome - please see Mr Williams.